Hello all you lovely people! I hope your week is going well, and if not, well the weekend is almost here! Today's post goes into one of my favorite things about blogging: connecting and collaborating with brands, specifically through your blog's media kit. If this term is new to you, then I'm happy to be the one to introduce you to this aspect of blogging! 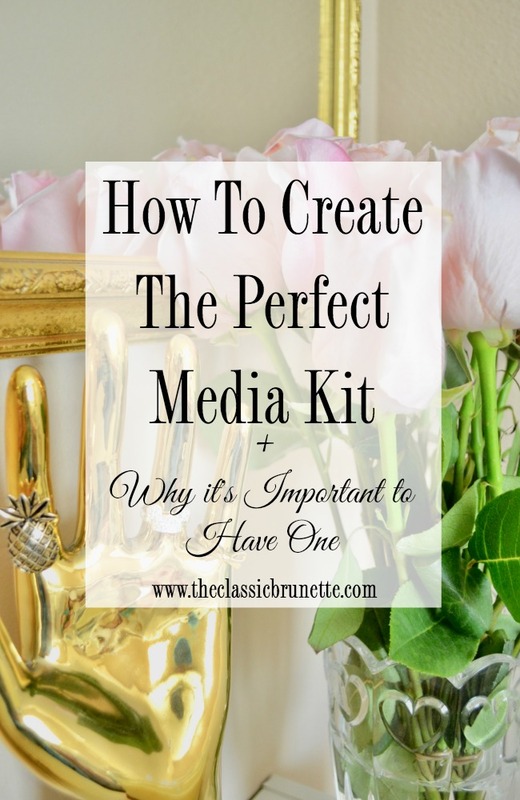 A media kit is a marketing tool that is used to help pitch your blog to brands. 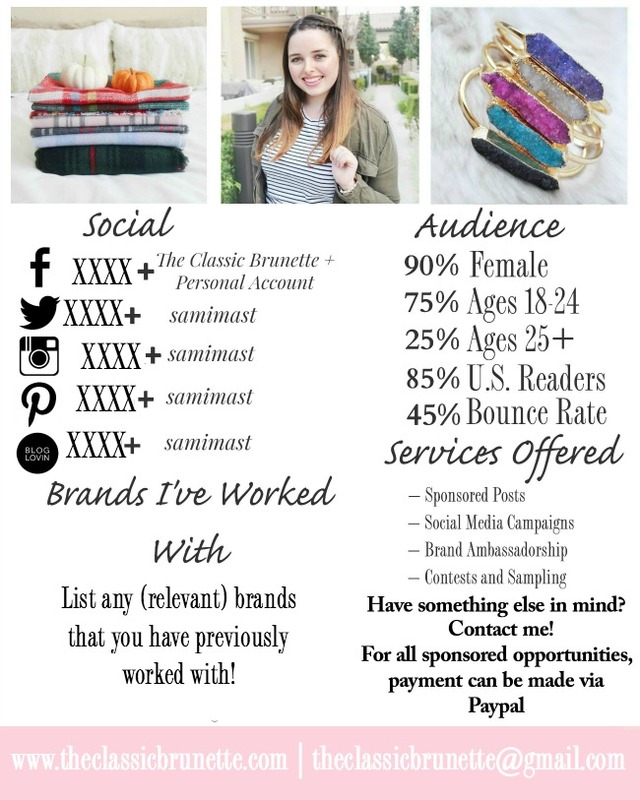 Usually in the form of a pdf, a media kit has everything about who you are, what your blog/brand is about, statistics, and past partnerships. It's your blog's resume, and it's important for it to represent your brand in a professional and attractive way so that prospective partners will want to work with you in the future. Depending on the blogger, media kits can be one page or multiple pages. I personally have a four page media kit, as I prefer to separate each page into categories and create simple layout that doesn't seem too crowded. Why Is It Important To Have A Media Kit? Whether you're reaching out on your own or are responding to pitches to you, having a media kit is a simple way to connect with a brand and let them know the basics about your blog. It's how you show your worth to a company, no matter the size of your blog, and why they should work with you. It's also a way to add more professionalism to your own brand. Just like having a resume to show your strengths, a media kit shows the strengths of your blog and why the client should work with you. Your value is in all the hard work you put into your blog, and a media kit is a great way to demonstrate that value into a condensed professional document. How Do I Make A Media Kit? The first thing you want to do is make sure you create an 8x10 graphic, so it's big and readable. For PicMonkey, go to design –> blank canvas –> choose 8x10. There's no right or wrong way to make a media kit, just as long as it matches your brand's color scheme and tone of voice. I've added my sample media kit below for example. I added some simple pink graphics, images, and writing. Nothing too complicated, you don't want to draw away from the information! Looking at my sample media kit above, you can tell that I substituted some areas where my actual stats and information would be! I did that so you can basically see how I organized everything, but also because I don't want you all to get caught up on any stats you see here for some reason. You can see from my media kit (which was inspired by Rachel from Hello, Her's media kit) that it has a lot of colors from my color scheme: light pink, white, and black. I was going to add gold, but it didn't really fit. I also wanted to include some images from my blog/instagram to demonstrate what a potential collab may look like image-wise. What Do I Need To Include In My Media Kit? Shown in the example above, this is where you discuss what your blog is about, why it's unique, who your audience is, and how you connect to them. If you want to be concise, you can combine this with your blog bio into one paragraph. I chose to have separate paragraphs in mine as I think it's important to introduce who I am outside my blog as well. I stress that this should only be max three sentences long. Talk about what makes you as a person standout, who you are, some likes, and what you are passionate about. Always include your blog stats in your media kit, it's practically the most important part! You should at minimum include your monthly pageviews, social media followers (including individual account stats), unique monthly sessions. I also like to include stats about my audience, so brands can see if their audience matches up with mine. These stats include audience gender, age, location (by country), and bounce rate. Everything besides the social media stats can be found on Google Analytics! Like I said above, I like to have multiple images throughout my media kit as examples of my work. Whether the images are of previous sponsored content, or just photos that I think represent my brand, I want it to almost seem like a portfolio and resume rolled into one. These images should be representative of your brand and showcase your best material. Make sure brands know your face! If you decide to make a multi-page media kit like me, make sure you have a head shot (not a full body shot) on the first page. I also like to have it next to my personal bio, just because it makes the most sense! If you have a logo, put it on there! It's another identifier of who you are and what your brand represents! I don't have a logo, so I just used my signature font! This is a great way to showcase past relevant work to new brands! You don't have to include any actual work, just a list of companies you have worked with in the past will do. Again, make sure these collaborations are relevant, as a fashion brand probably won't see your restaurant review as an accurate representation of the work you will give them! For some reason this is a touchy subject in the blogging world, but bloggers get paid and it shouldn't be a huge secret! Blogging is a job, and you should be getting paid for all the effort you put into posts! I have a few different rates that I include in mine. I chose to not show these here, however if you have any questions about rates or how to add them correctly into your media kit you can email me! 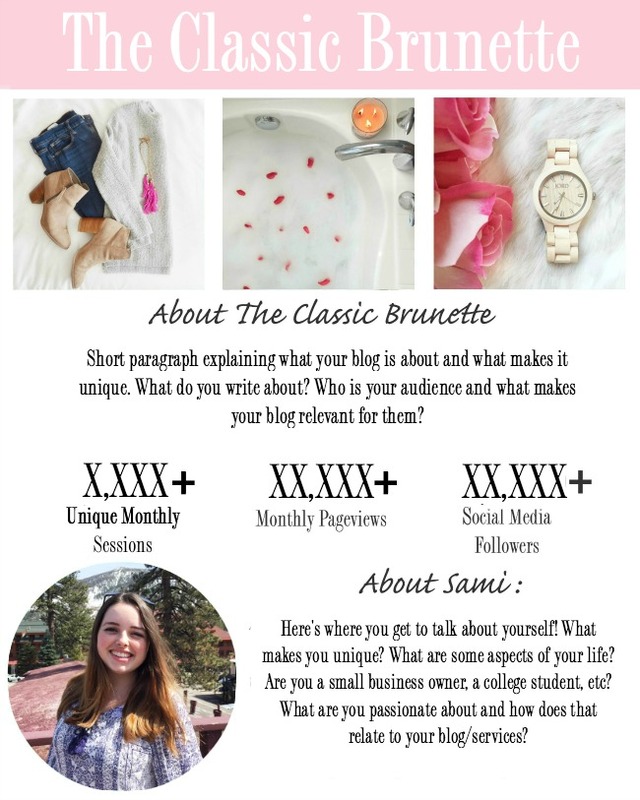 (theclassicbrunette@gmail.com) I include the different types of blog/social media packages I offer and then singular rates as well! Duh! How is a brand supposed to get ahold of you if they don't know any of your information!? Add in your website, your email, and all of your social channels. I like to add my social media handles right next to their own statistics. I've Made My Media Kit, Now What? You want to export that beauty into a PDF so it's ready to send out! I took my individual images (pages) and saved them to my desktop. Let's be honest, I'm not sure if there's a better way to do this, but this is what works for me! I highlight all of the images, double click them so they all open in preview(if you have a Mac! ), organize them into the order you want and click print. Yes, print. In the bottom left corner there should be a little dropdown option labeled 'PDF.' Click that and click the option 'Save as PDF.' I have tried going straight from preview to 'Export as PDF,' but it didn't work properly, so this is how I do it! Now you're ready to send it out to companies and get those partnerships going! Also, don't forget to update your media kit as you go along! I like to update mine every month to make sure the statistics are still correct, and add in new partnerships. Sometimes I update the social media stats weekly if they're changing fast enough! If you have any questions about media kits (or anything else for that matter!) you can ask me in the comments or email me directly! I wish you all the best of luck! WOW! This post is jam packed with such great info :) Thanks for sharing! I pinned it to remind myself to come back and read it again. I don't really believe in media kits. I mean, if someone asks me about the numbers, I can give them of course, but people can find out your stats with tools that are specially designed for this (like similarweb.com). That's interesting, I wasn't aware that there were tools like that! I've always had brands ask about my stats and just found it easier to have a document ready to go as they usually ask for my rates at the same time. For me it's much easier to have it all in one place! I'm totally updating mine right now! Yay, I hope this helped! I was just thinking of updating my media kit! I absolutely love this post. Thanks for the tips. Thank you so much, glad I could help! Love this post!! Lots of great tips! I need to go and make a media kit soon!! I will be following these tips! Thank you! I'm so happy I could help! Making a media kit is on my list of things to do! Thanks so much for your advice! The sample page really helped me understand what I need to do. I put off making mine for so long because I never knew what they were supposed to look like! I'm glad I could help you out!! I just recently made my first media kit and am working on tweaking it! For too long I didn't think I needed one but after showing it to my first company and getting a sponsored post I am excited I did! Congrats on your first sponsored post!! That's huge! Love your media kit! That reminds me I should really update mine! Just updated mine this week! Great post. How do I find out my audience? If you have Google Analytics set up you can go to your "All Website Data" page, on the left side click Audience –> Demographics –>Overview and that will get you your audience's gender and age percentages! To get your audience's location percentage go to Audience –>Geo –> Location. Hope that helps! I'm always tweaking my media kit and this gave me some new ideas. Love when others share examples of theirs. great post, I need to get to making one myself, and this is filled with great tips, so thank you! So many great tips! I used to make media kits for my previous sites as they were magazines & collabs. Now that I have a personal blog I should do this more than ever... maybe your post will give me the motivation to do so, thanks! I have been considering a media kit for a while but it's something #i had no idea about. This post was really informative and helpful thank you! SO helpful!! Love your kit- I need to revamp mine so badly! That is a great idea to make it in pic monkey, I need to do that. I just started making my own media kit last year. I love it. It is a good way to showcase what you have to offer a brand! I just updated my media kit the other day. Thanks for sharing yours, looks great! Media Kits are soooo important. Thanks for providing a great for people to use to get started! I'm actually in the process of creating a media kit for my blog. This is so helpful! The Classic Brunette's Beauty Birthday Giveaway!